I have not had the time to paint or hobby these last few weeks, because I am about to move house. This involves a fair deal of painting and remodelling work in the old one to make it ready for sale. But today I managed to grab a couple of hours. Chosen for simplicity, but more so because it happened to be one of the front minis on the undercoated-and-ready-shelf. This figure seems to be comprised of many different skeletons and parts, from several species. There is at least one dog in there as well. I don’t know what this “Savage Worlds” setting is, but I expect it to be something pulpy set in the american west or similar. 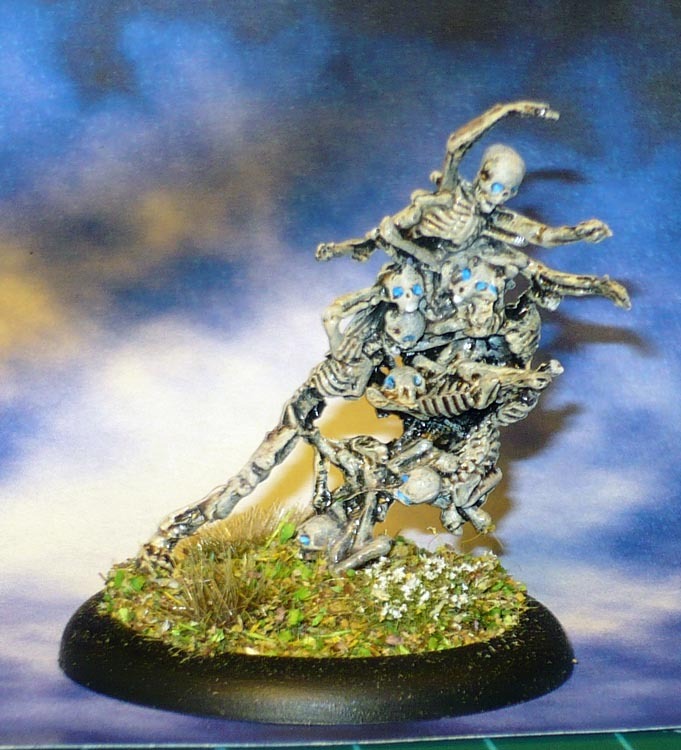 The other minis are texas rangers in stetsons, an undead gunslinger, some steampunky mechanic type , a giant prairie tick and this ambulatory pile of bones.